This Small, Portable Instrument Evaluates the Appearance of High Gloss Surfaces. Remains in extended calibration for approx. two months. Standard RS232 interface for data transfer and control of instrument from a PC. Remains in extended calibration for approx. 2 months. The two samples below illustrate a real life problem for gloss measurement: two identical gloss values (20° - 91), yet an obvious visual difference.This appearance phenomenon is known as haze and to date there has not been a practical way to measure it. 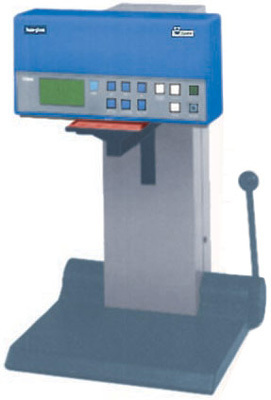 Only Gloss and Haze measurement allow a complete evaluation of the phenomena “gloss”. Until Haze-Gloss, it was very difficult and expensive to measure the phenomena reflection haze. The Haze-Gloss enables you to measure reflection haze as easily and fast as you can measure gloss. You can measure specular gloss, mirror reflection and reflection haze all in one unit. In the development of the Haze-Gloss, equal emphasis was placed on accuracy, reliability and measurement comfort. The simultaneous measurement of gloss and reflection haze allows a secure and objective evaluation of the surface quality. In addition, the haze value is an indirect method to evaluate paint and raw material properties, such as: dispersion degree, flocculation behavior and wetting properties.